Words and images are the real tools of magic-making, stronger than wands or cups or candles. They hold a deep and ancient power to create or alter our realities. From shadows and handprints on the cave wall to whispered incantations, even with no altar or physical tools, a witch or shaman (or anyone, really) can effect powerful changes. This is why the way that you see yourself and present yourself to the world is so very important: even an everyday object like a business card can hold and transmit that power. I thought about this a lot when I realized it was time to buckle down and make real grown-up style business cards. For the past couple of years, I’ve been satisfied using moo cards – they fit nicely in the vintage cigarette case I like to carry, and I liked how each one was different, unique. But for all their individual uniqueness, they were also becoming very recognizable – I wasn’t the only person anymore with cute, little bitty moo cards, dammit! In a handful shaken out of my purse at the end of a night, there wasn’t much to distinguish my card from anyone else’s. Not that presenting your business card needs necessarily to resemble an arcane ritual out of American Psycho – especially considering how in this day and age, they are perhaps in danger of becoming somewhat unnecessary. And yet, there’s something nice and seamless about just handing someone your card – especially if you have a name that’s kind of difficult to spell or interpret in a noisy nightclub. I enjoy the ritual of it, the harkening back to Victorian calling cards or cartes de visite, left on a silver tray and presently by a butler (oh, if only…) I like the idea of someone coming across the little paper rectangle emblazoned with the images and words I have chosen to convey a sense of who I am, and maybe remembering our paths crossing, however briefly. I believe that what you say or think about yourself, you bring into being, quite literally: meaning, you are the only one that has the power to invent yourself, or reinvent yourself. The image that you present to the world at large is who you are – or it can become so, all rooted in those deep, initial perceptions. When someone says, “Oh, I’m so clumsy” or even “I’m so broke!”, they make that reality truer, by enforcing it with their words. I think of the years when the question, “So, what do you do?” would make me so uncomfortable. I hated admitting that I worked in a shop, or that I waitressed at a sushi restaurant, or sold cigars. I didn’t realize that I was being too literal – I thought I wasn’t allowed to say I was a writer or an artist unless I made money doing those things, unless I was recognized and successful. But whether or not I have books published (oh, but I will! ), or even if no one ever read a word I wrote, I would still be a writer. I write. It’s what I do. There’s something about owning that word, though, that makes it more real. It’s a covenant entered between me and the world at large that says that this is what I do, what I’m supposed to do. I’d do it even if I never admitted it to a soul, but in defining myself as such, I say – “there, now! Now you MUST!” I don’t (thank the moon and stars!) have a day-job anymore – my time is solely devoted to reading tarot, making jewelry, oh and – selling antiques and curiosities out of a booth at Uncommon Objects, of course! I decided not to put that on the cards, or mention the events I do, or the custom costumery and maquillage, because after a certain point, I think it just gets a little ridiculous to have to describe yourself with so many occupations, even if you do them all. I don’t ever really want to have to narrow down, but having some clear focus does make it simpler to get a grip on what you really want to be known and remembered for. In thinking hard about how you define yourself publicly, in giving yourself space to redefine as needed, you push yourself, and allow yourself to grow into what you want to be. I thought about that a lot when I was working with the amazing Lau of Recspec to come up with just the right design for my new cards – and as usual, she did an incredible job. Having a professional designer who intuitively knows not only what you’re looking to convey aesthetically, but also has the skills to execute that design impeccably is such a gift. I am so lucky to know this woman! 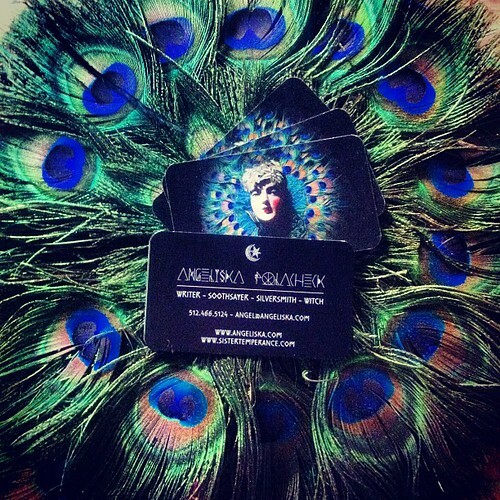 I recommend her very highly if you’re looking to revamp your business cards/website/logo/personal branding/et cetera! She’s a wizard. I am indescribably happy with the way these turned out: witchy and sleek and lovely! 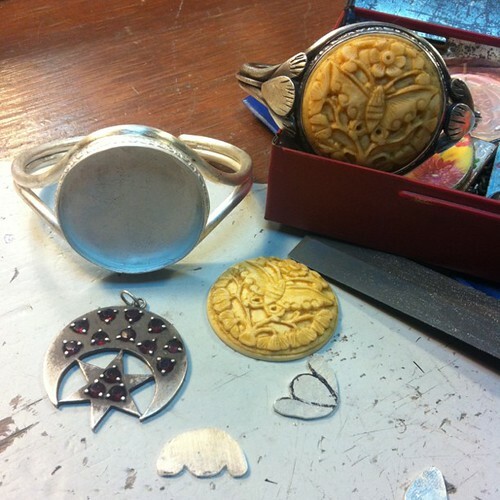 Defining myself as a silversmith was another big step for me: I’ve been making hand fabricated sterling silver jewelry for about three years now (oh gosh, maybe more?) Ridiculously, I have made most pieces as gifts, and eagerly given them to loved ones without always getting decent photos first, so after all this time, I don’t have much to show. Also, my process is pretty laborious, especially since I decided to tackle absurdly ambitious projects for the first few years. Oh, and – I’m super slow and easily distracted! So, whenever I do actually finish a piece, it’s kind of a miracle. I decided this year to focus less on crazy love-objects, and more on jewelry that I could make with an eye towards actually selling. I was so thrilled when I sold my first major piece of jewelry recently, to a lovely and very creative lady, Miss Adrienne Ehler. I met Adrienne a while back when she came to have her cards read, and we’ve stayed in touch since then. She had expressed interest when I posted that the moon moth cuff bracelets were for sale, and has been saving up to buy one ever since. I am incredibly honored and excited that she fell so in love with this piece. I wear mine every single day, and I had hoped that its twin would eventually find its home. Imagine my delight when she contacted me and told me that she wanted to buy it! I love the permanence of working in silver, and the idea that if (heaven forfend) you ever lost one of the pieces, it might be buried for thousands of years under layers of soil and sediment – only to be discovered and marveled at by archaeologists of the future! I love adding secret details like these roller-pressed leaves to bezel backs – little details that are normally only seen by the wearer. Why leave something plain when it could be beautiful and meaningful? 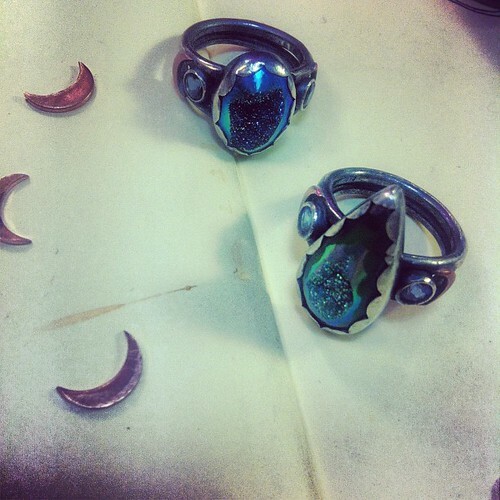 These elfin priestess rings are part of a collection I’m putting together featuring lots of celestial drusy, tube set tanzanites and sapphires and copper moons. I like making jewelry that looks mystical and ancient. 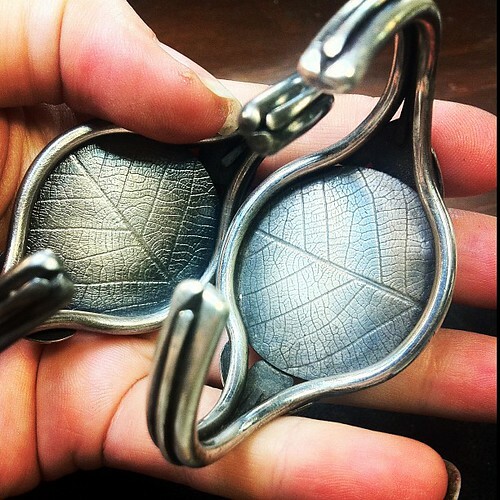 Also, each piece is completely individual and made entirely by hand – even the pieces I do multiples of. 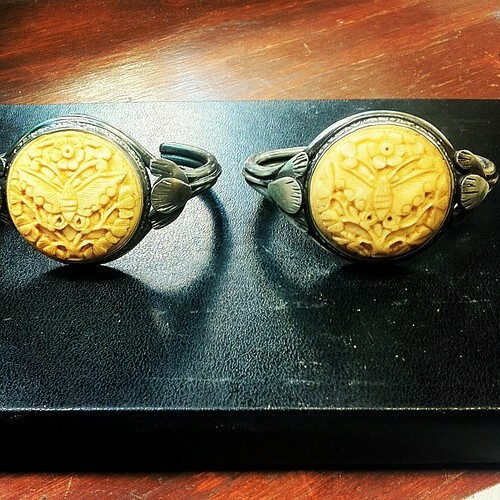 Nothing is cast, or mass produced – which I have nothing against, but it explains why what I make is so special, and why it will always cost more than a lot of other jewelry out there. 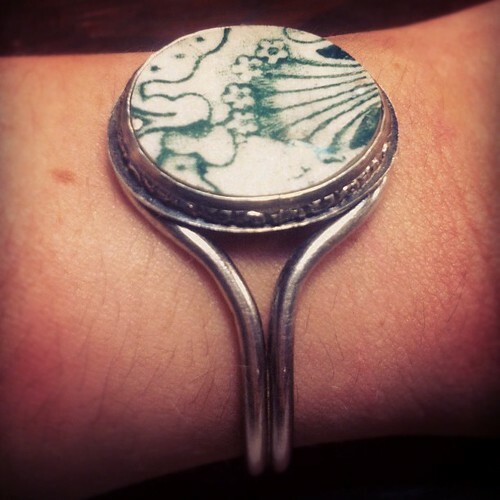 This sterling silver and porcelain cuff was made for my sweet sister Mlle. Dana Sherwood – the china piece was one of many cut into cabochons by my Grampy for my mama back when she was alive and making jewelry. She didn’t live long enough to use them all, so I’ve learned how – to honor her legacy as a jeweler. This little collection of broken plates, collected and saved by my mother, lovingly shaped into ovals and circles by my grandfather is the main reason I make jewelry today. I knew that out of all the legacies she left to me, this one called to me with a voice I couldn’t bear to ignore. Those beautiful pieces didn’t want to stay tucked away in a box forever! Hopefully one day, I’ll be able to do right by her violin and guitar as well. 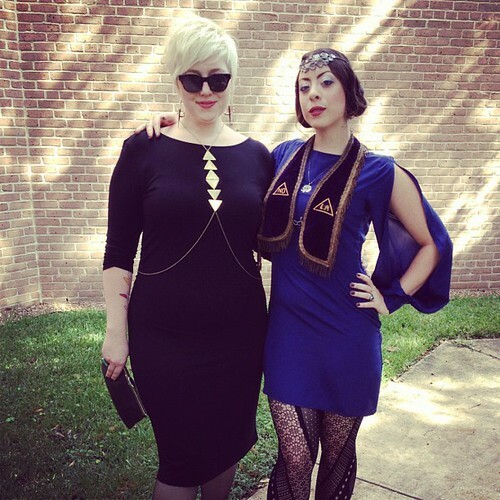 This is how we do it: the delightful Miss Stilwell and I giving haute priestess realness at the Rothko Chapel. I was invited to perform the wedding ceremony for two of our dear friends, Will and Allison. Ah yes, and the witchery and soothsaying! 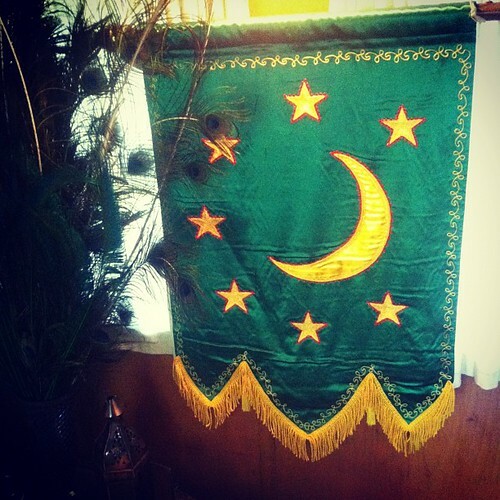 Two more important words to embrace and uphold: namely by working in service to my community by teaching, reading tarot and performing liminal ceremonies like weddings, baby blessings, and funerals or memorials. So far, it’s only been weddings, but the others are equally important and sacred. I believe strongly that these moments of honoring and crossing over thresholds are best celebrated by someone who truly cares to make the effort for the experience to be both solemn and joyful, magical and heartfelt. Friends keep asking me, and I’m honored every time I get to help make their special day into a memorable ritual. I’m so excited to be resuming teaching tarot and witchery class to my two young students, Rowan & Pearl! 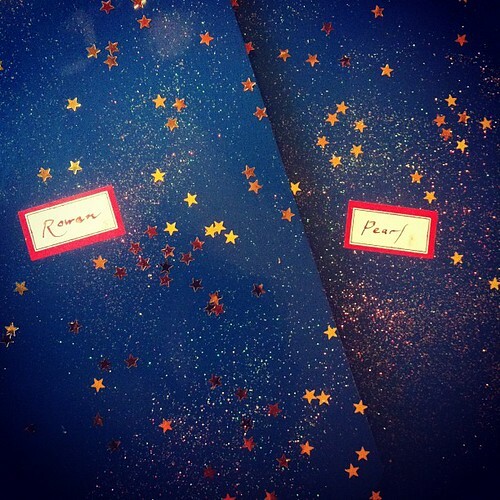 I embellished these composition books with gold stars and sparkles for them to write their magical study notes in. They are the cutest little witches ever. 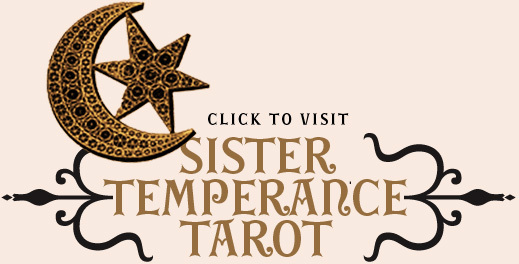 Lau is also working on my Sister Temperance site (what’s up there now is only really a pretty placeholder! 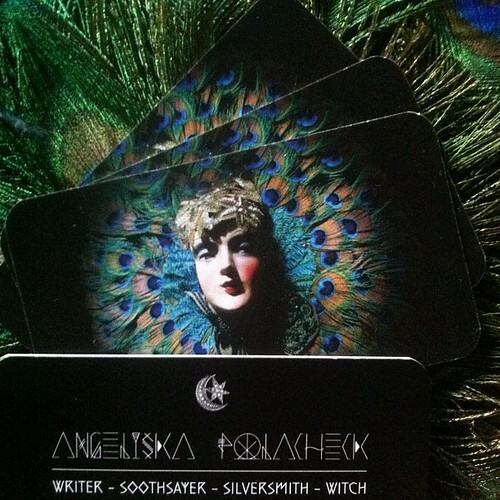 ), so I’ll soon have a place to devote to my writings on the tarot, and to offering long distance readings for folks who don’t live in Austin. I’m so freaking excited about this, I can barely stand it! I love doing this work more than anything else I’ve ever done. I missed it for years after I left New Orleans – for some reason, for the longest time, I never believed could make a go of it here, but I am being proven wrong! 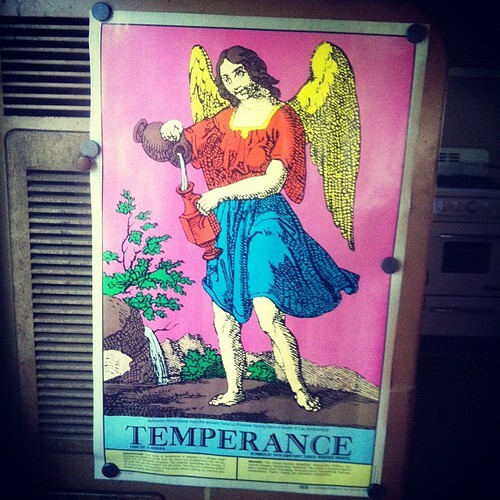 Once I have a place to put all my tarot musings together, I’ll tell you why I chose Temperance to be my muse and guide in this work! 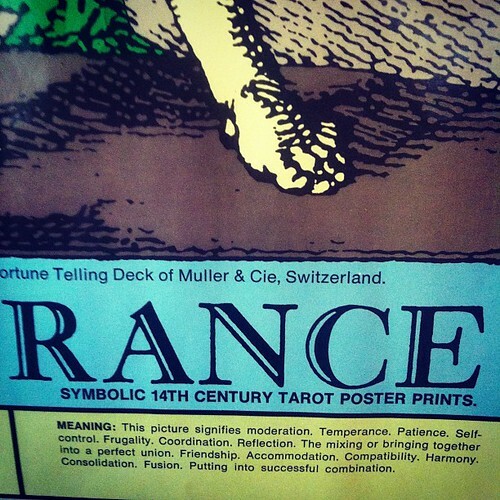 It has always been my most favorite card, out of all the Major Arcana. 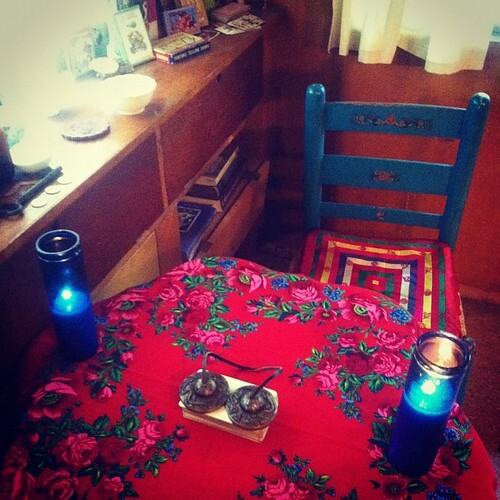 If you are in Austin, do come visit me for a reading – I make appointments between 2pm and 10pm most days. Otherwise, keep your eyes peeled for online readings, more jewels for sale, and other witchery! Is that card stock as thick as it looks? Very interesting to hear about the silversmith side of you! I never really knew about it, based on your previous writings. And your silversmith work is lovely. Also, the post is most apropos. Thank you for sharing your wisdom and vulnerability with the world. I can’t even begin to express how much it has helped me. 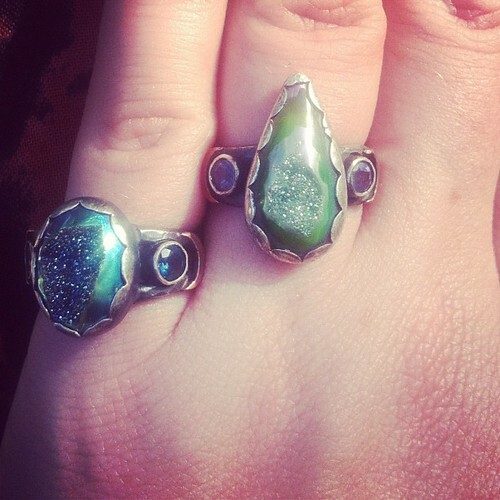 The druzy rings are gorgeous in every way.